What inspires you? We all have things that inspire us to create, dream, acheive and hope. Have you thought much about what brings you inspiration? Do you take the time to cultivate doing these things? This is a subject I think about from time to time as I seek inspiration as a writer and human being. In fact, as I write this I realize that just thinking about inspiring times brings me inspiration. It is a powerful emotion. For many of us, great works of art inspire. There is something about seeing a beautiful painting or reading a well-constructed novel or listening to music that gives us the desire to craft our own art or at least feel a sense of well-being and hope. It is certainly very individual. I remember 20 years ago, on a trip to Barcelona, standing in the Miró museum and feeling an incredible sense of both peace and excitement. Here in this beautiful city was a museum filled with striking modernist paintings of bright blues, yellow and reds. The subjects were simple. “Woman and bird.” The canvases were large and filled with color and the museum itself was bright and cheerful. 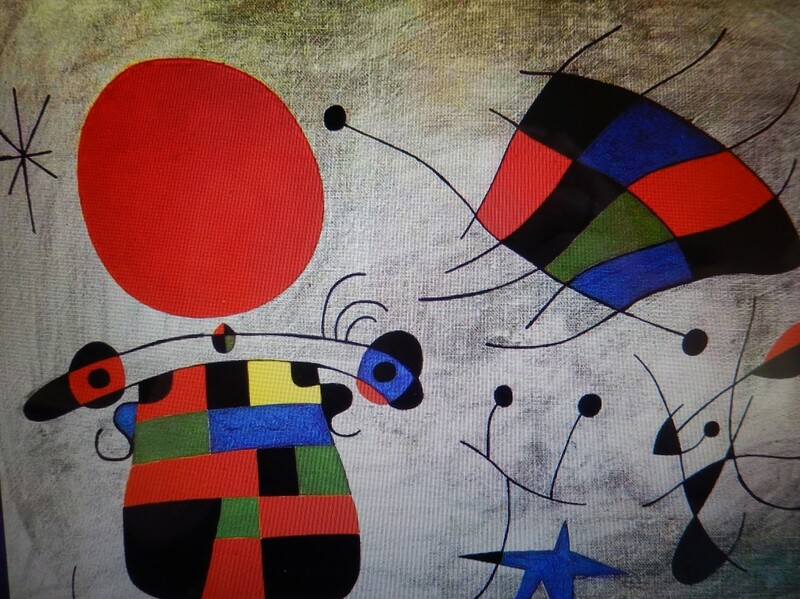 To someone else, Miró’s works might seem too abstract and simple or even silly, but for me the paintings were both elegant and whimsical. I felt buoyant as I passed through the halls and wondered if I could ever achieve such beauty. Sometimes I remember those paintings when I need a boost of creativity. Often times we are inspired by someone’s personal story, especially if it is a story of overcoming the odds. Last year I read the autobiography of Supreme Court Justice Sonia Sotomayor and it’s no surprise it was on bestseller list. In the book, Sotomayor, the first Latina to join the court, recounts her journey from living in the projects in New York city with an alcoholic father and absent mother to attending Ivy League schools and eventually reaching the nation’s highest court. What helped Sotomayor succeed? Partly her success can be attributed to her natural intelligence and being in the right place at the right time, but what is really inspiring is her determination to follow her dream from a young age. She talks about first being inspired to be a lawyer while watching Perry Mason shows on TV and reading Nancy Drew. She worked hard in high school, joined the debate team and asked for help to learn to study better. She made it to Princeton and when that turned out to be tougher than she thought, she buckled down and spent summers with a professor improving her writing, learning new words and reading classics that she hadn’t read as a child. In short, she kept focused on her goals and never gave up. This is a story I remember as I work on my goal of speaking Spanish fluently. I’ve worked at it steadily for many years now and although I still have a lot to learn, I don’t get discouraged. Like Sotomayor, it’s also no surprise that Stephen Hawking’s life made for such an engaging story in the recent film “The Theory of Everything.” In it we see him succeed despite his progressing disease. The most inspiring part of the film for me was towards the end, when Hawking is confined to a wheelchair and must use a computer to communicate. Despite his limitations, he doesn’t give up and continues to pursue his dream of finding one theory that can explain everything in the universe. In one key speech toward the end of the movie, he tells the audience that everyone has a special talent they can give the world. I thought about that scene a lot and what my special talent might be. Stories that inspire don’t have to be from famous people, of course. I remember once being in a writing class that included a 40-year-old African-American man whose story was striking. Every week he came to class dressed impeccably in a suit and tie and carrying a briefcase, coming from his marketing job. He spoke with authority and conviction about many topics. As the class progressed, we learned that he had grown up poor, oftentimes homeless, moving with his mother and sister from relative’s homes to apartments to homeless shelters in innercity Los Angeles. One week he told us the story of how he had dreamed of going to Pepperdine University in Malibu. Pepperdine was about the farthest thing from his experience, being located on the hills facing the ocean in swanky Malibu. He applied to Pepperdine but didn’t get in. Undaunted, he made an appointment with the admissions department and he and his mother traveled to the school. Within an hour in the appointment he had convinced the admissions officer that he should get a place in the school and the school admitted him. It was a great story and made me realize that i would never have thought to argue my case with an admissions department. It was a bold move. I often remember it when I am faced with barriers in my own life. Perhaps one of the best ways to be inspired is traveling. We get a chance to see, feel and taste how others live and even subtle differences in lifestyles can make an impression. J recently spent a week on the East Coast visiting colleges with my son. In Boston we stayed with friends who have a teenage daughter. They live in a old Colonial-style house with two tortoises and an iguana (they are allergic to cats and dogs). I’ve known this family for 25 years but have never stayed in their house before. For the first time, I got to see their habits (what time they got up in the morning, when they went to sleep), what they liked to do in their free time and the food they ate. I was impressed that both days we stayed with them, the couple made a point to go to the gym. It seems to be an activity they enjoy together. They came back from the gym looking refreshed instead of tired and it made me think maybe I should give going to the gym another try–or at least exercise more. One morning when they went to the gym their daughter Anna made beignets, donut-like fried pastries. She said she had learned about beignets on a trip to New Orleans and has made them ever since. I watched her carefully as she mixed the dough, rolled it out on a board and dropped each piece in sizzling oil. 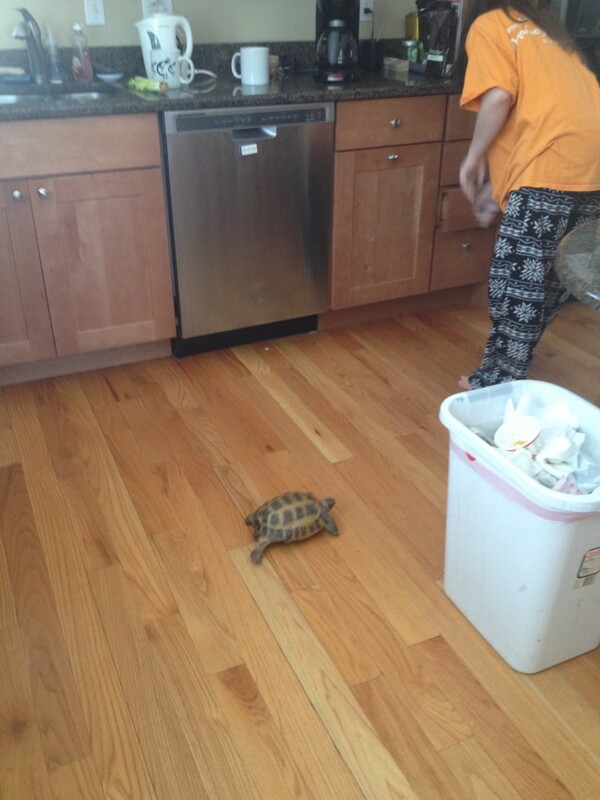 Meanwhile one of the tortoises walked by and found a warm spot to rest in the kitchen. Outside, the day was sunny but cold, with snow still covering the yard. Soon we had a big plate of steaming beignets sprinkled with powdered sugar and we had a wonderful conversation about her school, activities and family. At that moment I hoped I could demonstrate that kind of hospitality to my future guests. The great thing about inspiring moments is that you can savor the memories and retell them. In sharing them their power expands to more people and to yourself. These stories can become like legends, shaping your worldview. The more we share, the more we can combat the negative stories in the world and the modern sense of malaise we sometimes feel as cogs in a big wheel. Personally, I need lots of inspiration to live well and I’m glad I live in a time when I have access to so many books, movies, news, museums and people. The next source of inspiration is just around the corner.